Just announced this week is the exciting news that TrueScale Miniatures will be releasing four iconic 1:43 scale replicas late this summer. 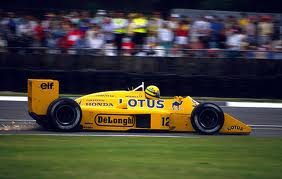 We are pleased to hear that they will be producing the stunning Lotus 99T F1 car as driven by Aytron Senna in 1987. We are expecting the version from the 1987 Monaco Grand Prix in which Senna won and also the version he raced at the 1987 Japan Grand Prix to second place. Also due to be released is the innovative six wheel Tyrrell P34 from 1977. Due to be produced is the version driven by Ronnie Peterson in the 1977 Belgium Grand Prix to third place and also the replica from the 1977 Brazilian Grand Prix. Due to the iconic status of both cars and drivers we are sure that these we be very fast sellers once they are released. We are expecting these models in stock from August onwards.